All electric vehicles have at least one traction motor, so the market for electric vehicle traction motors is one of the largest markets for electric vehicle parts and a primary determinant of the performance and affordability of a given vehicle. IDTechEx Research find that in 2013 44.6 million electric motors will be needed for vehicles, rising to 147.7 million in 2023. Today, the motors that propel electric vehicles on land, through water and in the air are mainly brushless because brushed commutator motors are on the way out. Most of the number and the value of those brushless traction motors lies in permanent magnet synchronous ones, notably Brushless DC "BLDC", a form with trapezoidal waveform, and Permanent Magnet AC "PMAC", a type with a sinusoidal waveform. No matter: they both have excellent performance including simple provision of reverse and regenerative braking. However, that dominance is about to change. The main reason is not those well publicised but elusive in-wheel motors coming in at two to six per vehicle but simply the move to much larger vehicles and therefore larger motors. 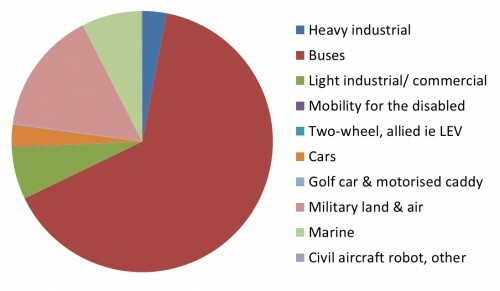 At present, half of the money spent on traction motors for electric vehicles concerns very small vehicles such as mobility scooters and power chairs for the disabled that are so popular in Europe and the USA, mobile robots in the home in Japan and "walkies" meaning pedestrian- operated golf caddies very popular in Japan, stair walkers, motorised lifters, sea scooters that pull the scuba diver and, of course, those hugely popular two wheelers in China with 34 million e-bikes alone sold worldwide in 2011. Add tiny quad bikes, All Terrain Vehicles ATVs, go-karts and golf cars and their derivatives. 92% of electric vehicle traction motors are currently needed for those small vehicles and they are therefore sold substantially on price. In a huge change in mix in the electric vehicle market and therefore the electric motor market, those small EV motors become a mere 25% of the electric vehicle motor market value in 2023 as the big vehicles, and therefore big motors, become very successful. For example, the value of the market for military electric vehicles increases over 20 times as military forces buy battlefield hybrids rather than just small pure electric runabouts. The bus market value rockets nearly seven times as China, in particular, buys huge numbers of large hybrid versions as part of its national transportation plan. Better reported is the burgeoning electric car market where hybrid versions in particular are behind a nearly six fold growth in market value over the coming decade. All this turns the world of traction motors on its head. The electric motors that are required for the bulk of the market by value are becoming much higher in power and torque. For example, an Autonomous Underwater Vehicle AUV - like a torpedo but making its own decisions - can push 400 kW, a large forklift or bus delivers 250-350 kW per motor but cars typically need up to 70kW per motor with a low-cost electric bicycle merely offering a 0.25 kW motor. At the large end, torque from the traction motor is up to 6000 Nm yet only 0.2 to 0.5 Nm is needed by many two wheelers and mobility vehicles for the disabled. The heavy end is territory where the asynchronous motor is winning now that its performance has improved and the cost of the control electronics has been got under control. For example, the Heavy Industrial category refers to heavy lifting as with forklifts and mobile cranes and here IDTechEx finds that 89% fit asynchronous motors otherwise known as AC induction - brushless traction motors with no permanent magnets. Around 63% of military vehicles and 52% of large buses fit asynchronous motors on our analysis of 212 electric vehicles, past, present and planned. Toyota, world leader in electric vehicles by a big margin, is using asynchronous motors for its forklifts and buses and has now developed them for possible use on its cars, which currently use permanent magnet motors. Some of the assumptions in this report lack credibility. In the battle between asynchronous motors and synchronous they state. IDTechEx does not accept the conflict as one primarily between those using expensive neodymium magnets and those with allegedly lower inherent costs. In the larger electric vehicles performance matters more than cost and anyway, asynchronous motors use a lot of expensive copper and control circuitry. This report goes on to predict they expect 100 Million in-wheel motors will be sold in 2022 but only for single motor vehicles, notably two wheelers, but only 5.6% of traction motors sold will be for multi-motor vehicles - mainly in-wheel motors. IDTechEx contradict their earlier position Re: BLDC Vs ACIM by saying that cost is more important than performance when it comes to in-wheel motors by assuming Mitsubishi shelved the Lancer Evolution iMiEV project in 2005 based on costs while Fiat apparently have some random concern about wheels jamming?? The cost elimination associated with manufacturing transmission, differential and friction brakes or the added performance, safety and energy efficiency benefits are not investigated at all. Frankly for a report that sells for $4,250 this is poor analyses.